IMO purely in terms of utility I still think it's better to put it in the area where we write about ourselves. I've previously put in desired shipping dates for personal reasons and my Santas were able to accommodate it. Whereas every other field is important for every participant I'm not sure how much use a proposed new field is, but that's just my opinion to finish this on my end. Woohoo! 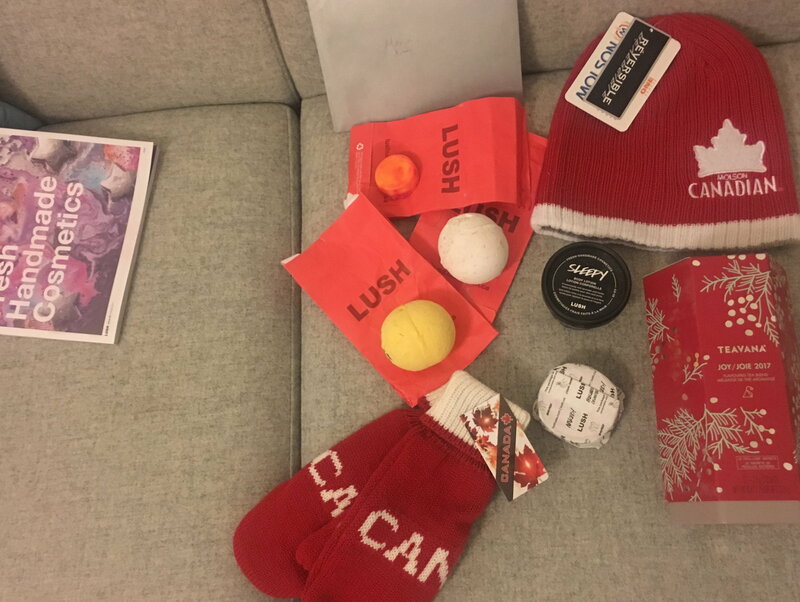 Today I picked up a package coming from my Canadian Santa (Reg) and I couldn’t resist just peeking to get a glimpse of the contents. The smell was so good I just had to open it to discover a lovely array of goodies: two bath bombs, a body lotion, a soap and a bath oil from Lush (plus a catalogue! 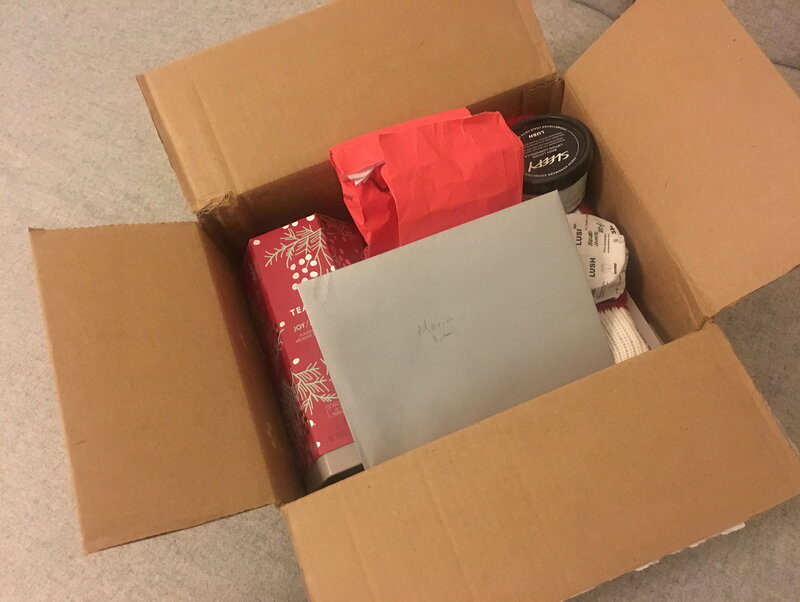 ), a pair of mittens and a beanie (both very Canadian ), a tin with a beautiful Teavana tea blend and a lovely handwritten card. I’m trying unsuccessfully so far to upload pics. Last time I could do it, but I can’t get around it now. I’ll try and edit this post and see what happens. I manage to do it! In any case, thank you so so much, Canadian Secret Santa! Lush is the bomb. That's a great gift, I would have loved it. Although I got this Aesop stuff for my gift which is also crazy good and has some very sophisticated scents I love. I dropped my gift off at USPS on Monday and they said it would arrive on Wednesday. It's Friday and the online tracking doesn't give me hope that it will even be delivered today. Is there a logo on the glass? It looks like it from the crop of the pic. Oh, yes i suppose I should have reformatted the photo. They have a Seattle Seahawks logo etched on them. How would most folks know which holiday their giftee observes? If I knew my giftee celebrated Hanukkah rather than Christmas, I'd be happy to ship early out of respect for their tradition. What would folks think of Wharvey adding "Which December holiday do you observe?" to the questions next year to make this event a bit more inclusive? I do celebrate Hanukkah but I will be happy when my gift arrives, whenever that is! And before anyone beats me up > Kwanzaa begins !2/26 and continues through January 1. Reminder - Santa wharvey asks that you email him when you send your gift. He also wants to know what you received and when. Please don't get on his naughty list by not complying with this request. The old boy can get a little testy. The last thing the Elves need to see in the workshop is a grumpy Santa. onetess and aquamarinesteph like this. Amazon sends me notices when I order something, when they ship it and again when it is delivered. When do we notify Santa, when it's shipped or delivered? You'll have to re-read what was originally outlined; and far be it for me to comment but, I'd let him know when you/Amazon said it was shipped. It will be up to your giftee to tell Santa what was received and when. I've been keeping Santa updated, but I'm going to assume (although I guess I shouldn't) that due the sheer number of us vs poor Santa that we should consider it normal if we get no response? I've finished three presents with four and five going out next week and I've kept him updated, but no response. I thought that was normal and didn't worry, but now I'm wondering if I need to resend or something? Stop worrying. You'll hear from Santa if there are any issues. Now leave the boss alone. He's busy. T - 23 days. Our favorite movie http://www.imdb.com/title/tt0039628/trivia Miracle on 34th Street. I was panicking because my recipient is in the Netherlands and have only managed to find something that will be useful / fun instead of getting something obvious! I hope he/she does not mind it arriving after the 5th of December! 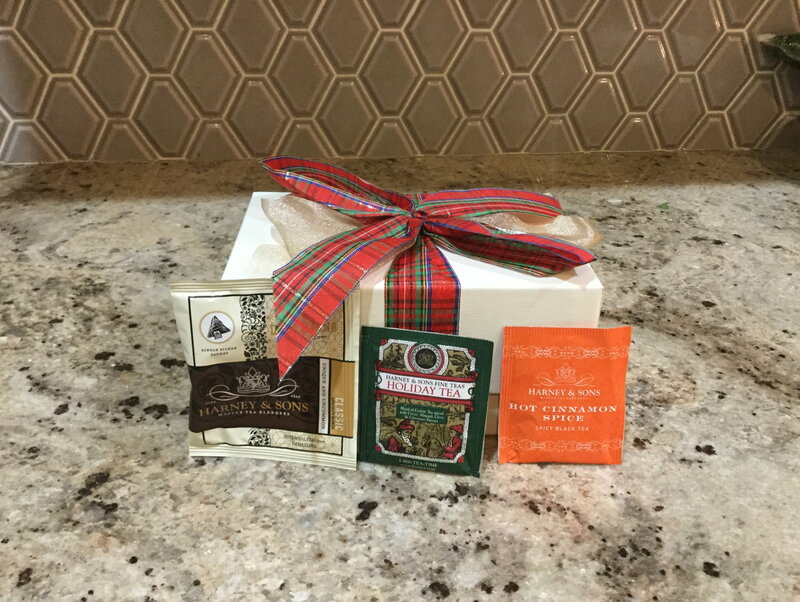 I received a wonderful box of teas from one of my Flyertalk Secret Santas today! There is a selection of 7 loose teas plus 3 additional flavors to try. It has been a tough 48 hours-my Mom is out of state at an assisted living facity. She isn’t doing well-and I have been sad about the likelihood that her 89th Christmas may be her last. Coming home to the box of teas after a 4 hour train ride home today really lifted my spirits. Thank you, Santa! 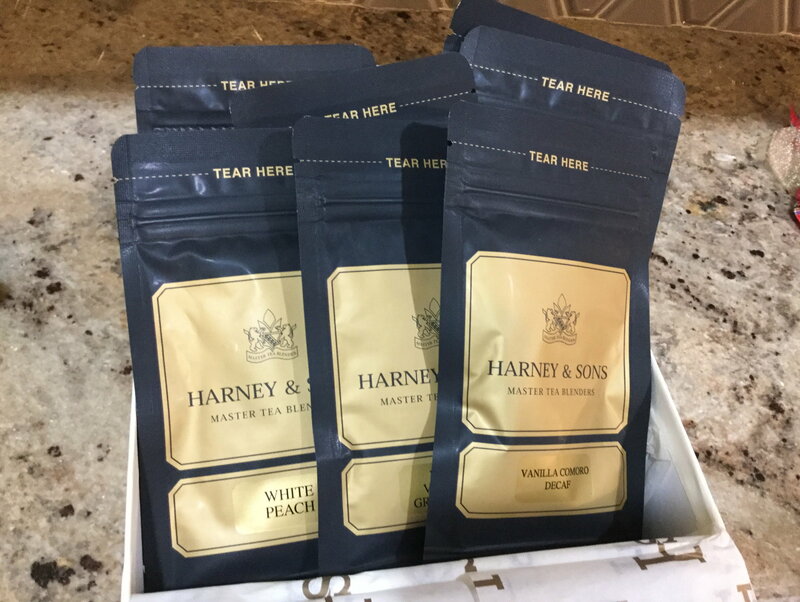 Here are the 7 teas that were in the Harney and Sons box. My husband made me peanut butter chocolate chip cookies to welcome me home-tea and cookies it is!